Dark Titan Entertainment has revealed the first of many events of the Dark Titan Universe. Events will be major points both story-wise and character-wise. The first three events equal up to the first chapter of the Dark Titan Universe as a whole. Seeds have been planted since the release of Dark Titan Knights and continue to grow. The three events are Day of Octagon, Crossbreed, and The Resistance/Protectors War. A ten-part event. The Resistance and The Protectors unite with other heroes to combat the artificial intelligent force known as Octagon as it sets out to transform the world into a land of only machine and digital. A seven-part mini-event. The Unkinds have finally found the location of the Yonderers. Now, the young team must put aside their ongoing feud with General Rilla and his Fellowship of Nubreeds in order to combat the incoming forces of the Unkinds. A six-part event. A series of events have caused both The Resistance and The Protectors to come to a disagreement, each side accusing the other, leading toward a war between heroes. Day of Octagon begins in December 2018. Crossbreed begins in June 2019. 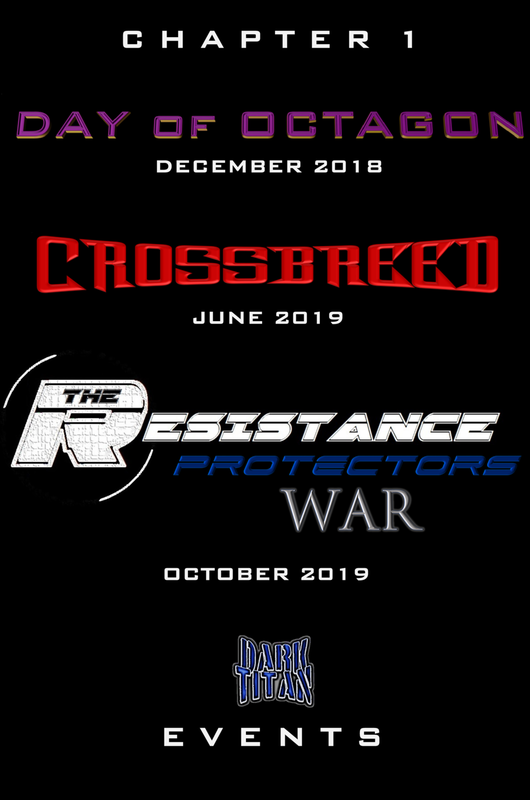 The Resistance/Protectors War begins in October 2019. Until then, check out the current titles of the Dark Titan Universe.